"My dogwalker, Calla, is the best and my dog loves her. She always follows my instructions to the T and is extremely responsible and attentive. My dog is also sensitive and needs some extra TLC and she is always happy with Calla, and always happy to see her. Calla has also dog-sat for me several times while I travel, and she is the only person who my dog feels comfortable with while I'm gone for (up to 2) weeks at a time. I have had other friends dog sit for me in the past and my dog chooses to not eat for the first few days, but with Calla she is comfortable and happy and never has that problem. I am so grateful to have found this co-op and even moreso, grateful to have Calla as my dogwalker." "We've been with Rainforest dogs for two years. Our walker, Theo, is fantastic with our dog. He treats him as if he's his own. Theo is always on time, he's respectful of entering our apartment, and extremely trustworthy. Our dog always gets his full 30min walk (if not more). We don't always need consistent walks and the pros who run rainforest dogs have no problem accommodating our last minute needs. They are affordable and part of their profits go to help charities. Highest marks for rainforest dogs!!" "I ended up dropping [a different dog walking company] to look for another service. We had communication issues and my pup would often get walked 30 mins to an hour outside the time window we asked for. Doors were left open in my apartment from time to time, which is a big problem as my dog loves to get into bathroom trash and spread it all over the apartment. Not a terrible walker but I felt I could find better; so far it's been a great experience with Dog Walking for Rainforests." "Dogwalking for Rainforests is an amazing service. What they do for the environment and my dog is brilliant. I am really happy with your service and so is Riise (Bull Dog puppy). Thanks for everything." "It's cool knowing Chaser (Boston Terrier) is doing her part for a good cause. Every walk not only keeps her trim and happy, but donates to a good cause." "Just want to say thanks for taking such good care of Stella (Rottwieller/Shepard mix) for the past year...I don't know much about a dog's memory, but I am certain that Stella considers you an important part of her pack and will recognize you lovingly as long as she lives." "I appreciate the great job your cat sitter always does taking care of my three babies (two Bengal cats & one domestic shorthaired)...she's terrific." "We think the dogwalking and housesitting services provided by Dogwalking for Rainforests are first class (and we've used several supposedly top-notch services in the past). Our dogs, Mia (Husky) and Annabel (Dachsund), adore their walker. Perhaps more important still, we trust her with both our dogs and our home. 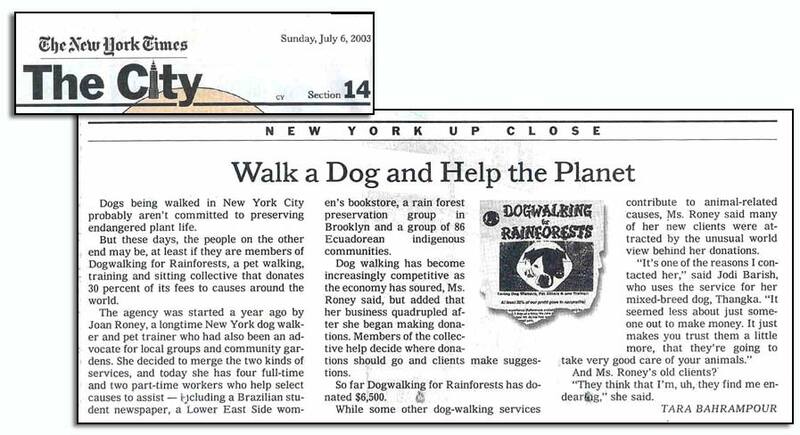 Lastly, the philanthropic approach taken by Dogwalking for Rainforests is both unique and rewarding in so many ways." "I have two dogs, both Pit Bull rescues. 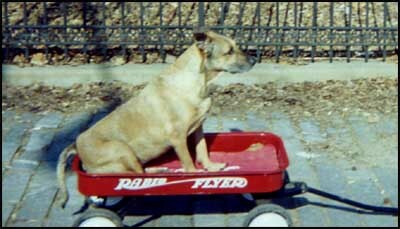 One of them, Red, at around two years old became very vicious towards other dogs. Over the past year and a half the aggression had gotten worse. I couldn't let him off the leash for fear of a fight happening. Walking him on a leash even became difficult if he saw another dog even a block away. I started working with your trainer and after the first training I saw a huge difference in him. After four trainings Red was able to finally touch noses with another dog, wag his tail and kiss them. He wagged his tail so much. I am amazed by the difference in my dog's behavior. But I think Red is the most amazed & the happiest. He can now have a social life once again." "Above is a picture of my dog Chopper. Recently chopper passed away. In her last years chops developed serious arthritis and although [she] was fully alert and playful she had a hard time walking. I started to use this service and had a wonderful dogwalker named Brian who came to my house everyday and took chops to the park in her little red wagon. She loved to swim in the park and looked forward to her time with him everyday. This made a HUGE difference in her quality of life and for that I am so grateful. This is an impeccable service that really takes the time to get to know the owners and the pets and make a difference in their lives. Brian still walks my other pooch, Thangka, and we love the service.